Renault has been doing exceptionally well in the country and it is all thanks to the hatchback that they spawned locally, the Kwid. The car has all the power trains and unique approach towards a car in this segment which has taken off. The sales are sky rocketing, Renault is climbing positions in the market and gaining market share. To make sure this continue and profitable streaks also stays high, Renault has just announced a limited edition for the Kwid. Called the Kwid Live For More edition, the car gets cosmetic changes inside out to make sure it woo’s its target audience. On the exterior part of the ‘Live For More Edition’ car, the Kwid gets dual stripes running the length of the body and along the sides. In addition, we can also see red accents on the grille and the similar things on the wheel covers too. 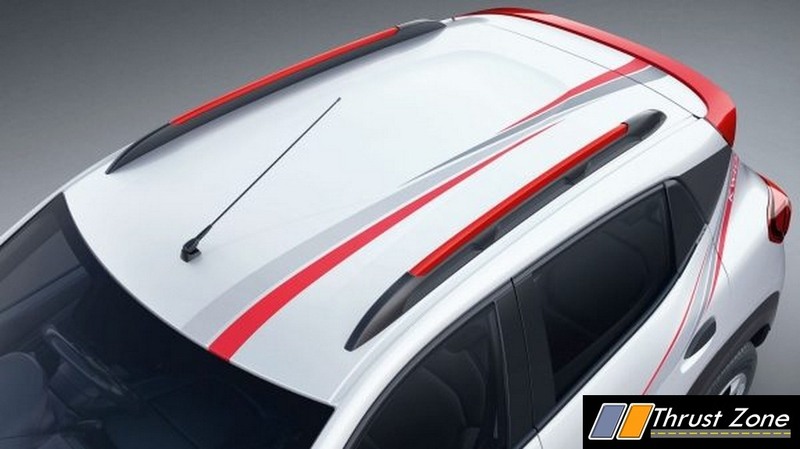 Renualt offers constrant coloured rear spoiler as a part of the package. Get inside and you see, the steering wheel has been fitted with red coloured contrast stitching for starters. However, the touchscreen infotainment system will be made available across specified models. Mechanically, untouched, the the Renault Kwid can be had with two engine and two gearbox options. The 800cc motor that churns out 53 BHP and 72 Nm. The other engine is the 1.0-litre engine that produces 67 BHP 91 Nm. Both motor come with a five-speed manual. Meanwhile the 1.0-litre engine variants has an option of a five-speed AMT. Renault Kwid Live For More Limited Edition range comes at no extra cost and the prices starts at Rs 2.65 lakh. Meanwhile, the 1.0-litre AMT (with driver airbag) is priced at Rs 4.31 lakh. This limited edition is clearly a move by the French automaker to finish the stocks of the MY2016. Royal Enfield Classic 500 ABS With Rear Disc and Euro 4 Engines Unveiled, India Launch Soon!